By now, many of you must have heard about the recent headlines about North Korea. Its 4th hydrogen bomb test that has been proven successful by its own internal media has disconcerted the international community. 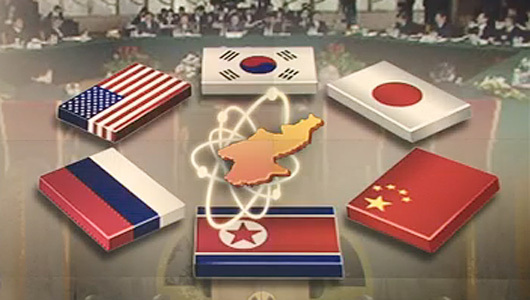 South Korean government shown the most alarm (at least the gesture of it), and proceeded to create an assembly happening today with representatives from Japan and the U.S. arriving at Seoul to discuss directives toward the nuclear matter (what’s called 6자회담 or 6 Party Talks). They will take this discussion as a foundation to approach Russia and China for further diplomatic negotiations. The anxiety and gravity of the situation that has triggered a frenzy of media reports and diplomatic talks seem surprising in light of a another crucial fact that has been conspicuously ignored by mainstream media pundits and diplomats in Korea. This is the overwhelming scientific reports that challenge the recent information about the North Korean hydrogen bomb test. International media, ever since the news about the bomb surfaced, has downplayed the situation. Whether it’s VICE, TestTube, ScienceMag, Reuters, etc., reporters have been issuing statements of skepticism. 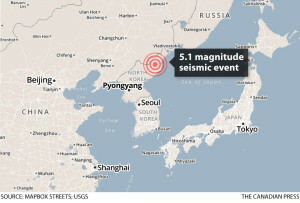 The 5.1 magnitude earthquake along with the detonation yield of 6-9 kilotons (CNTBTO calculation method) have suggested that yes, the experiment probably involved the nuclear, it probably was a failure or involved traditional fission-based weapon rather than a modern thermo-nuclear device. In other words, international community, if you exclude governments, does not seem too worried, focusing on assuaging the intensity of the North Korean reports. On the other hand, Korean media has been treading on the opposite by inflaming the issue, and left-leaning news agencies like 한겨레 and 연합 hasn’t done much to combat the intensification and fear-mongering. The reason is obvious; generating fear in the public through mechanisms utilized by those above is profitable for fomenting nationalism, militarism, and strategic alliance among U.S., S. Korea and Japan. 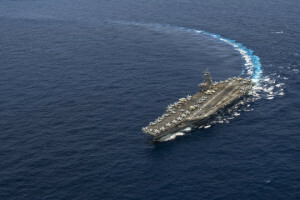 Already, U.S. has exploited the situation by investigating the possibility of sending an aircraft carrier earlier for military exercises to “send a warning message to North Korean leader Kim Jong Un” (Yonhap). Although the joint U.S.-ROK military exercises like the Command Post Exercise (CPX) and Field Training Exercise (FTX) were slated for March, recent nuclear transpirations have ushered the U.S. officials to ruminate on holding the exercises next month. 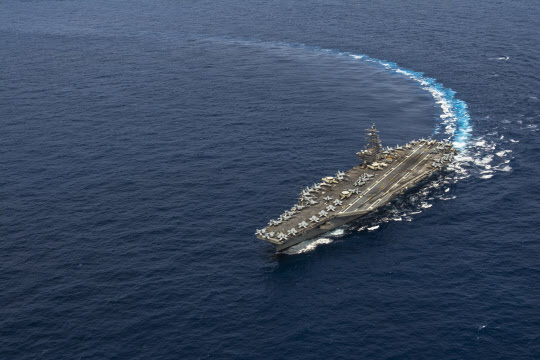 The irony of the situation is that the carrier that will arrive to South Korea is the Ronald Reagan (currently anchored in Yokosuka, Japan), a nuclear-powered warship, so the western concern about North Korean nuclear projects is met with a certain hypocrisy. There are more realistic concern for the people of Gangjeong, however. Although it seems impossible for the gigantic carrier warship to be docked at Gangjeong Naval Base, events like these will slowly enable the other U.S. naval forces to come down to Jeju Island. The U.S. needs a reason to send its forces to Jeju, and North Korea provides the perfect rhetoric and excuse. How to slow down this future is always the same: to call out the excuse and present evidences that challenge the mainstream narrative in order to avoid and prevent overreaction of the media and the government that try to create fear among the public for obvious reasons.